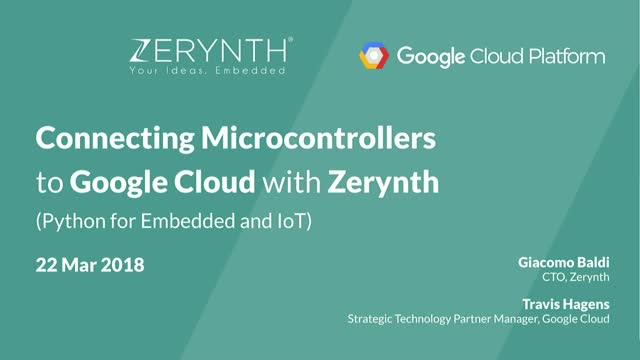 The webinar will introduce how and why to build IoT solutions in Python using Zerynth and Google Cloud IoT. Zerynth provides a software development suite that enables programming firmware in Python on 32-bit Microcontrollers and easy connectivity to IoT Clouds. - how to use Python to easily exchange data between an Espressif ESP32 board powered by Zerynth and Google Cloud IoT. Hear from members of the team who developed the exam about how this certification differs from others in the Google Cloud Certified program and how to best prepare. Register now and get free access to a series of hands-on labs to jumpstart your learning and preparation for this exam. All webinar attendees will also receive a voucher to take a course on Coursera for free. Go behind the scenes of the new “Machine Learning with TensorFlow on Google Cloud Platform” specialization on Coursera, which will teach you how to build production-ready machine learning models. During this webinar, Lak Lakshmanan, Google Cloud Machine Learning expert, will preview some of the Machine Learning techniques you will learn, walk through a demo of how to debug TensorFlow programs, and share insights on the exciting field of Machine Learning. Register now and get free access to a Machine Learning lab to jumpstart your learning. All webinar attendees will also receive a free voucher to take the first course of the Coursera specialization for free. Join cloud and desktop virtualization experts from Google Cloud, Forrester and itopia as well as top IT professionals to dive deeper into the key trends and technologies shaping desktop virtualization and the delivery of remote applications in 2018. With the explosion of cloud desktop and RemoteApp solutions it is becoming harder for organizations to cut through the noise and implement the best solution for their business. Learn the key considerations every IT department should focus on when evaluating cloud desktop providers and why desktop virtualization using hyperscale clouds is the secret to delivering the flexibility, performance and price modern businesses demand. Data is growing fast, but your IT budgets are flat. See how you can save 70%+ of your Network Attached Storage (NAS), disaster recovery and backup costs with the Google Cloud Storage and Komprise. Learn how other customers are leveraging the cloud to transparently archive cold data, lower DR costs and shrink backups. As a small team, building a service based around wireless sensors can be a daunting task. IoT products specifically can be fraught with distractions in the early days: decisions around what wireless link; what embedded processor; and what cloud and device management service can complicate things for even the most-experienced technical founders. Small teams getting a product to market must be disciplined and focus on solving problems core to their value proposition. In this webinar, team members from Helium, Wallo, and Google Cloud IoT Core will share details on how to approach building connected applications and getting first prototypes into the field faster. Connecting all the pieces to make zero downtime continuous delivery happen at scale is a challenge. Join this webcast to see real teams bring all the components together to make high-velocity deployment to Kubernetes scale. Get a hands-on view of the critical steps that go into making container management a scalable process that not only allows teams to delivery faster but with more confidence in the final result. In this webinar we will be using BigQuery, Cloud Machine Learning Engine and Data Studio to mash-up OnPoint Weather Data with Google Trends Data to reveal how weather influences what people search for. Check out how to improve IoT security by securing the authentication between Google Cloud IoT core and IoT devices using a secure element (ATECC608A) from Microchip. - Isolate private keys from Software: Once a patch is released, it reveals the software weakness to the attacker. It can take a long time to fully patch an IoT hardware which gives enough time to the attacker to penetrate the system. - Isolate key manipulation from the 3rd party contract manufacturers: Not only from the equipments in the supply chain but also from the operators in the supply chain. In addition, we will deliver a live demo of a multi-cloud marketplace working together with cloud billing tools. We will also answer live questions from the webinar audience. Mongoose OS provides developers with a quick way to start IoT development on microcontrollers and connect them to Google Cloud IoT Core. Successful digital transformation requires connected product solutions delivering agility and control. An Open System approach to IoT provides the agility to leverage best of breed tools and integrate with your existing enterprise systems, and the control over your data to ensure maximum future value. An Open System architecture powered by GCP infrastructure enables your IoT solution to flexibly evolve over time as new devices, business models, and technologies create opportunities for your enterprise and your customers. - IoT systems are living systems, and an Open System approach on GCP creates connected product solutions that evolve rapidly to take advantage of new opportunities and create long-term business value. One of the biggest barriers to cloud adoption for IT organizations is the inability to move applications to and from the cloud. HC3 Cloud Unity is a collaboration between Google and Scale Computing, to solve this problem. By linking Scale’s hyperconverged HC3 on-prem with HC3 on Google Cloud Platform a massive two-way speedway has been created that means organizations no longer have to use or create different apps for the cloud, they can utilize their apps created for on-prem to run in the Google Cloud, which will be a game changer for end users, channel partners and MSPs globally. Did you know that enterprise-grade NAS (file storage) is one of the capabilities available to users of Google Cloud Platform (GCP)? In this talk, Google's Ben Chong and Zadara's Noam Shendar will discuss VPSA® Storage Arrays and how they bring on-demand, elastic, high availability, high performance file storage to GCP. Do you struggle managing your cloud spend? Are you ever surprised by your cloud bills at the end of the month? Do customer billing inquiries send you into a cold sweat? In addition, we will deliver a live demo of setting up and using cloud billing and budget tools and dashboards. We will also answer live questions from the webinar audience. The average enterprise executive invests over $20M per year in Big Data technology. The work required to turn this investment into enterprise value has been arduous and perilous at best. According to Gartner, 60% of Big Data projects fail. Building an enterprise-grade data warehouse in days, not months. Josh is responsible for driving AtScale’s product roadmap and strategy to deliver what customers need to succeed, and has worked with data and analytics since 2000. He started his career as product manager for the first “Datamart in a Box” at Broadbase, and ran product management for one of the largest Data and Analytics operations in the world at Yahoo!. Before AtScale Josh was VP of Product Management at Pivotal, where he was responsible for Greenplum, Pivotal HD, and HAWQ. Josh received his undergraduate degree in Ferrous Metallurgy at Brown University and his MBA from Stanford. 1. Extract all of your data from the Google Cloud Platform and other SaaS applications to gain key business insights and prepare your data for analytics. -Customize your pipeline schedules and much more! Xplenty is a data delivery platform that allows organizations to easily integrate, transform and process data from all of their major sources. At Xplenty, we know that integrating, transforming and preparing data for analytics is no easy task. That's why we decided to build a platform that simply gets your data delivered. With our unique data delivery concept, we free you from the hassle of traditional data integration and ETL so that you can focus on what really matters: analytics, insights, and business value. Xplenty is reshaping the data integration ecosystem by introducing the data delivery concept. With data delivery, integration is only the beginning of the process. When you want to carry out an integration on the Xplenty platform, we make sure that it is executed perfectly so that you can focus on what matters in your business. Is your engineering team wasting time building a solution to sell your product, rather than actually building your product? Can your customers search your solutions, educate themselves on value, launch cloud trials, request POCs and purchase directly from you? In addition, we will deliver a live demo of setting up and running a cloud marketplace and take questions from the webinar audience. Google and Chef have come together to collaborate to manage the Google Cloud Platform (GCP) natively with Chef. Leveraging the ability of idempotency and Chef you can now declare cloud resources, using Chef, to manage GCP. By combining Chef Automate with GCP, we will show off the ability to programmatically spin up complete cloud infrastructures, without leaving Chef or the need of other tools. This webinar will show in action the first wave of products supported deploying a complete end-to-end solution into the cloud, from the ground up, straight from Chef. If you have Chef in your infrastructure or are interested in using Chef, your administrators, auditors, and executives will be interested in viewing this webinar. Google Cloud Platform enables developers to build, test and deploy applications on Google’s highly-scalable and reliable infrastructure. Choose from computing, storage and application services for your web, mobile and backend solutions.